The pretext was an old one. An increase in carbon taxes was imposed in 2017 as part of a push to support renewables. In 2018, the amount rose from 30.5 euros to 44.6 euros per ton, rising to 55 next year. Diesel and petrol have been affected, a matter than proves less of a problem for those in city environs, serviced by public transport, than rural areas, where the car remains essential. In the second round, France duly divided along the lines of favouring Le Pen or fearing her, hence Macron’s deceptively bolstered victory. The grand centrist was born, a person who had been warned in 2008 by friends that joining the Rothschild investment bank would mar his political prospects. The “Mozart of finance” is finding the job of governing France a far more complex prospect than the cold business of debt restructuring, mergers and acquisitions. But part of the issue with tarnished presidential popularity has been a diminishing of a position that always demanded a certain, high-peak majesty. The French president, gravitas and all, was also a European, if not global statesman. Macron’s predecessors, Nicolas Sarkozy and François Hollande, were also victims of the 2000 referendum which reduced the period of the presidency from seven years to five. (This is not to say these characters were not, in of themselves, defective in character or policy.) Then, as now, the French authorities also faced a national revolt over high fuel taxes. While seen as a necessary mercy for a modern time, le quinquennat had the added effect, according to historian Jean Garrigues, of encouraging the leader to be seen as temporary commodity, easily purchased, irritably used, then disposed of. “Voters no longer believe in ideology, they consume and then reject their elected representatives, including the President of the Republic.” A clue was in the 2000 referendum turnout: 70 percent preferred to stay away from the polls. “A little yes, but a big slapdown,” came the observation of le Parisien. As ever, the French, masters of the strike, had initiated something similar at the ballot box. The Yellow Vest movement is not a Gallic shrug but a shaking roar. The initial target was increased fuel taxes, but the indignation has become a broader church of disaffection on living in general. It is also being given a ringing endorsement by political opportunists who argue that the movement has no political roots. Le Pen has been there, fanning matters while providing Christophe Castaner, the interior minister, a distracting if shaky alibi. 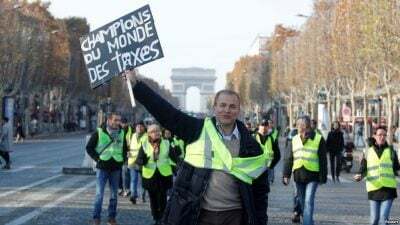 “The ultra-Right is mobilised and is building barricades on the Champs-Elysées.” For him, such protests are the work, not of a broad movement but a few casseurs, or troublemakers. Macron is doing his level best to avoid confronting the movement, but his Prime Minister Edouard Philippe is attempting to bribe the protesters into silence, or at the very least a more timorous form of disagreement. Energy subsidies to 5.6 million households, up from the current number of 3.6 million, are being proposed. France’s poorest families will also see fuel credits directed to those whose livelihood depends on car travel. These measures, alone, will be no panacea for Macron’s declining influence.